The RFNC was founded back in the early 1970s, but the story goes back much further to the football team of the Cummeragunja Aboriginal Reserve, which forged its reputation in the 1890s and 1920s – they became known as the invincibles! They won premierships in 1898, 1899 and 6 in 11 years in the Picola Football League through the 1920’s and 30’s, including four in succession from 1926-1929. However, the team’s strength stirred discontent within the Picola Football League, and in 1932 an arbitrary new rule set the maximum age for any player at twenty-five years. Since most of Cummera’s team members were older than twenty-five, the team was effectively neutralised. In 1932 the club — reigning premiers at the time — was forced to withdraw from the League. An Aboriginal team known as the ‘All Blacks’ based at Daish’s Paddock entered the Central Goulburn Valley League’s Second Division in 1946 and beat Toolamba 19.9 (117) to 14.9 (93) to win the premiership that year. Once again and with no shame the League met in the absence of any Aboriginal representatives and without reason voted to expel the Club from the League. The constant rejection by the country football leagues set the stage for the many challenges we would eventually face with the formation of the Rumbalara Football Netball Club as we continued the battle to gain the right to play sport and represent our people. Rumbalara (which means end of the rainbow) is a revival of these earlier teams. The Rumbalara Football Netball Club finally made its way into a mainstream sporting league in 1997. 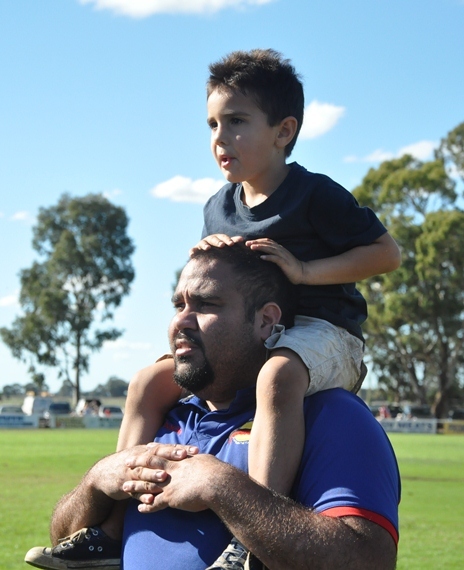 We won our first premiership in 1998, exactly 100 years after the first premiership was won by our ancestors in the Cummeragunja Football Club in 1898. The pennant hanging in the clubroom — Rumbalara: Premiers 1898 to 1998 — is a constant reminder of our club’s strong links to the past.